Drake's Plate -- the end of the mystery? For years, California schoolchildren were taught that a brass marker discovered in 1936 was Sir Francis Drake's "Plate of Brasse," recording the California coastal landing in 1579 of the English explorer and his ship, the Golden Hinde. That was the case until 1977, when Berkeley Lab's Helen Michel and Frank Asaro used neutron activation analysis on the brass plate and found that it was most probably manufactured between the last half of the nineteenth century and the early part of the twentieth. They found that what had been one of California history's greatest archaeological finds was not authentic. At the time, Michel and Asaro were in Berkeley Lab's Nuclear Science Division; Asaro is now in the Atmospheric Sciences Department of the Environmental Energy Technologies Division. Although he and Michel confirmed that the brass in the "Plate of Brasse" was modern, no one knew who had actually made the plate. Now the final chapter in the plate's history seems to have been written. At a press conference held February 18, 2003, at the University of California at Berkeley's Bancroft Library, historian-researchers claimed that the plate was devised as a practical joke by several friends of Herbert E. Bolton, who was director of the Bancroft Library from 1920 to 1940. Fascinated by stories about Drake having posted the plate to mark his California landing, Bolton often told his students to look for it in Marin County. The researchers' evidence suggests that the fake plate was meant to be a practical joke among friends, but the hoaxers lost control of their prank when Bolton authenticated the find publicly before they could tell him the truth. Although it was historical evidence that completed the story, it was science performed over 25 years ago by Michel and Asaro that confirmed what a few historians had suspected all along about the plate's dubious origins. Their neutron activation analysis showed that its chemical impurity levels were too low for sixteenth century English manufacturing techniques. They estimated that the artifact had been made no earlier than the eighteenth century and probably much later -- even as late as 1936, shortly before the forgery was perpetrated. 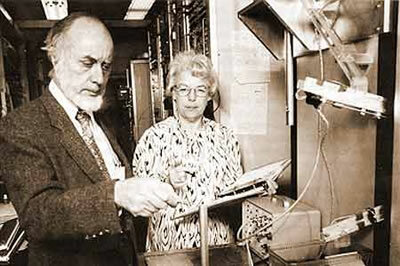 Beginning in 1967, nuclear chemists Helen Michel and Frank Asaro employed neutron activation analysis for discoveries including the tracing of ancient trade routes, the revelation that it was an asteroid that brought the Cretaceous Period to an end, and proof that Drake's "Plate of Brasse" wasn't made by Drake. In the mid-1970s the then-director of the Bancroft Library, James Hart, commissioned a new study of the plate in anticipation of the quadricentennial of Drake's landing. As part of this study, he asked the Research Laboratory for Archaeology and the History of Art at Oxford University in England to chemically analyze small fragments of the plate. He asked Glenn T. Seaborg, then Berkeley Lab's associate director at large, if someone on his staff would drill small samples from the plate to send to England; Seaborg asked Asaro if he wanted to do this. "I discussed this with my colleague Helen Michel, and we agreed to drill the plate," Asaro says. "But we also said we'd like to make some measurements too. This was acceptable to Professor Hart." Although they started with the expectation that the plate was authentic, right away Michel and Asaro began seeing things that made them suspicious. When they drilled into the plate, they expected to see corroded material; instead they saw fine strips of metal. The thickness of the plate was too homogeneous for something that would have been hammered out. Most important, neutron activation analysis revealed not only higher levels of zinc than expected for an alloy made in Drake's time -- zinc hadn't yet been identified in the sixteenth century -- but much lower levels of other metals like nickel, cobalt, silver, gold, lead, and iron. This suggested that the brass was a mix of high-purity copper and zinc, which would not have been available at the time. These and other clues led Michel and Asaro to conclude that the plate was recent. They wrote up their results and sent them to Hart. "He had wanted a four-page letter," says Asaro. "We sent him a 45-page paper." Hart published 16 pages of the report, and Michel and Asaro later published the complete report in the journal Archaeometry. Thus the plate was proved a forgery. Only the mystery of who had perpetrated the hoax remained -- until UC Berkeley's press conference in February, 2003.